With her tawny hair and dancing green eyes, many fall for her instantly. She takes it for granted that she could captivate any man who catches her fancy, though few men do. The likes of Mr Curshawe tire her, and she tolerates the wealthy Viscount Pamyngton, but no man amongst her many admirers brings that magic Georgy so desperately wishes for. But when there is a collision between Georgiana and the handsome young Dr. John Graham, sparks fly. He lets it be known that he doesn’t care for her at all, and Georgiana’s hurt pride demands revenge. She accepts a daring wager from to prove that she could indeed entice the young doctor…and jilt him savagely as well. But Georgiana is unaware of the whims of passion and unprepared for the events that ensue. Could this be what Georgiana has waited for all her life? 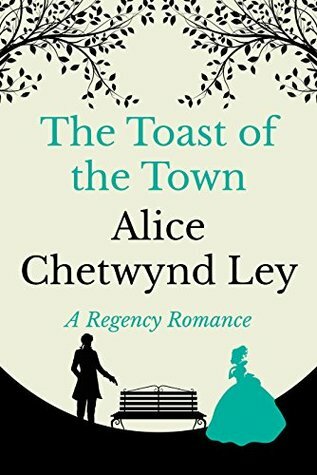 The Toast of the Town is another delightful Regency romance penned by Alice Chetwynd Ley. The second of three books in the Eversley series, these do not have to be read in order to be enjoyed (I read one, three, then two), but I think doing so would add to the reader's pleasure. Georgiana is not the sweetest of Ley's heroines, but I love her spark, and it was wonderful to watch her finally realise the truth of her feelings. Recommended to fans of Regency romance looking for a quick, simple, and pleasant read to pass an hour or two.